The Sydney suburb of Sutherland is 30km from the CBD, and offers a great mix of shops, parks, schools, and sporting facilities. It is also home to one of our florists. We deliver right across the area, to schools, businesses, hospitals, nursing homes, retirement villages, cemeteries, and places of worship. Churches include St Andrew's Presbyterian Church, St Patrick's Catholic Church, St John The Baptist Anglican Church, Good Shepherd Lutheran Church, Shirelive Church, Sutherland Uniting Church, and Sutherland Presbyterian Reformed Church. We also deliver to hospitals and other medical facilities, including The Sutherland Hospital, President Private Hospital, South Eastern Sydney Local Health District, Sutherland Medical Centre, and Sutherland Skin Cancer & Laser Clinic. We deliver to cemeteries, crematoriums and funeral homes in the area, including Olsens Funerals, White Lady Funerals, St George & Sutherland Funeral Home, Woronora Cemetery & Memorial Park, and Rockwood Cemeteries. For nursing homes and retirement facilities, our delivery zone includes Bupa Aged Care Sutherland, Lark Ellen Nursing Home, Southern Cross Care Nagle Residential Aged Care, Waterbrook at Yowie Bay, Catholic Healthcare Percy Miles Villa, and Donald Robinson Village. We are committed to providing not only beautiful fresh flowers and floral arrangements for all occasions, but also great customer service. We have lots of ideas to help you make an event or celebration extra special, including our Designer's Choice service. 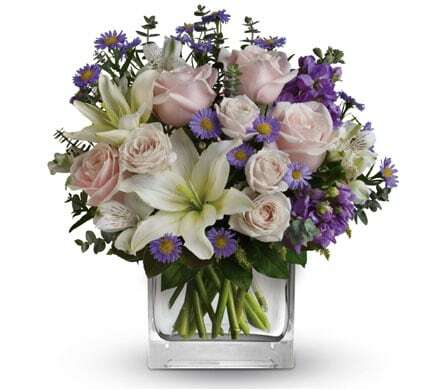 Flowers are always the perfect gift, and an ideal way to say 'Congratulations', or 'I Love You', or 'Happy Birthday'. We also deliver plants, chocolates, even cute little teddy bears, so we can always create something personal and special. For someone who's feeling a bit low of off colour, we recommend Pink Me Up, a delightful vase full of roses, gerberas and lilies, in all shades of pink. 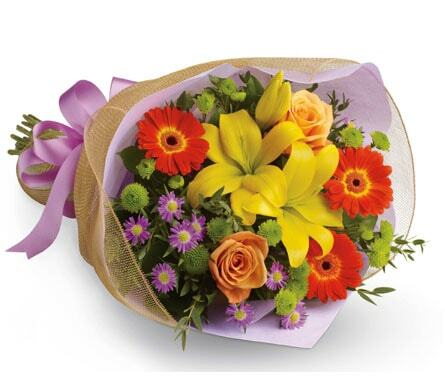 Citrus Splash always gets a smile, with its vibrant mix of orange, yellow and red roses, gerberas and carnations. Party Girl is just perfect for a birthday gift - a trendy glass cube vase, filled with orange roses and hot pink favourites. 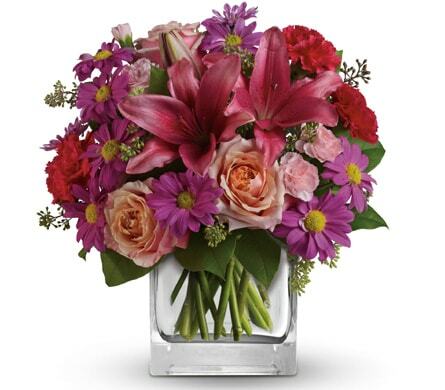 Or, for him, Sunset Dreams, with its mix of roses, lilies and mini carnations, in orange and red. Then there's weddings! A wedding just wouldn't be the same without flowers! With years of experience in creating beautiful wedding bouquets and arrangements, we will work with you to create something really memorable. Check out our Seasonal Bridal Bouquets for ideas. And what a wonderful location Sutherland would be for a wedding, with its many majestic churches and riverside parks. With excellent transport links from the CBD, and a variety of accommodation, it's time to start planning.